Committed to practicing as one of Sydney’s leading tattoo removal clinics by providing the best results possible, we have invested in who has proven to be the number one manufacturer of laser tattoo removal technology in the world. Quanta Systems have lead the industry with high-end machines for years and we are very excited to be operating their brand new machine, the first Quanta Q-Plus C Evo in New South Wales. The amount of evidence for complete scar free removals with this technology is overwhelming, and it remains unrivalled worldwide. A multi-application platform, it combines the technology of the original and most popular Quanta Q-Plus C model, with innovative Mixed Technology and an additional fractional hand piece, both allowing for a reduction in treatment time and improving the aftercare experience. Importantly, the Q-Plus C operates at three different wavelengths, allowing treatment of all ink colours. The Ruby wavelength (694mm) allows removal of more difficult blue and green inks, which other wavelengths aren’t capable of reaching. 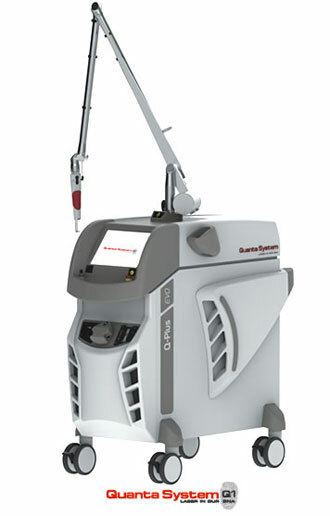 The fractional handpiece now provides an even more thorough tattoo removal process with its ability to significantly improve the reaction of the skin, which in turn aids what we believe is the most important component of the Q-Plus C Evo’s design, the ability to achieve tattoo removal without scarring. Additonally, the Evo has impressive speed, up to 10Hz (10 pulses per second) which not only allows for fast treatment of all tattoo colours, but also the ability to safely perform laser resurfacing of pigmented skin. Assisting the Evo throughout the laser tattoo removal process is the Koolio Optimal Air Cooling System, which minimises any discomfort during the procedure, as well as reducing swelling and extracting heat from the site, resulting in an improved rate of recovery.